September 2013 – Comedy or Tragedy? 1. I just found out my short story REVERSAL OF FORTUNE was a semi-finalist in the Writers of the Future contest. 2. I’ve started reading a new book that I can’t bear to put down — the DARWIN ELEVATOR by Jason Hough. 3. Drafting progress on PROJECT AWESOME falls into the “not too shabby” category this week. I’m about 52K in, so a little more than halfway there. 4. I watched the pilot episode of Agents of SHIELD. Aside from some pretty painful ‘as you know, Bob’ crap near the beginning, it was fun. Am I the only one with a little crush on Agent Coulson? And, that’s all from here, folks. What’s new with you? Since getting back from Kansas City last week I’ve been a little stuck with my writing. Exhibit A: I started three separate short stories this week, but I couldn’t get past the fifth paragraph on any of them. Each one had interesting characters and unusual settings, but they all lacked one important thing: a plot. I would get sucked into the mood and overall idea of the piece and then realize I had no idea where it was going. Exhibit B: the first draft of my current novel, PROJECT AWESOME, has been trucking along pretty well until very recently. Lately, though, instead of moving forward I’ve been going back over what I’ve written, tweaking and revising and…stopping dead anytime I get near the blank pages at the end of the document. The problem? I’ve reach the point in my outline that simply reads: “stuff happens to make Julia question her choices”. Yeah. The devil’s in the details, isn’t it? Basically, the problem I’m having with the short stories is the same problem I’ve been having with the novel. I need to back away from the page and sit down and figure out what the hell happens next. I finally managed to do just that for the novel this morning. And guess what I did this afternoon? Spewed out the subsequent two chapters as if it were nothing. Boom. Floodgates open and the drafting proceeds. I love outlines. Until I hate them, that is. The lesson I’m choosing to take from this (though I’m sure there are many)? Maybe I should start outlining my short stories. Greetings, dear Reader! I’m coming to you live from Kansas City, MO. After a brief three days at home I’ve headed back out again, this time not for vacation but for work. My research partner and I are putting the pieces in place to start a brand new field project right here in Missouri this coming summer. We typically do our fieldwork in Honduras, but things in Honduras have not exactly been peachy lately and the college that provides our funding won’t accept legal liability for the students we take with us into the field. So, while we wait and hope that the drug-traffic related violence and political instability in Honduras will be short-lived, we’re planning something Stateside so we can keep our field school running. A lot of this trip is about logistics. Meeting with people. Getting permits and paperwork in order. Making plans, etc. There’s as much of that in archaeology as in any other profession — maybe more! As those of you who follow me on FB and Twitter are aware, I had a bit of trouble getting down here (the usual BS delays and weather and such), so even though it’s an archaeology work trip, I did get some writing time in as I waited in the airport and on the runway, and so on. I’m feeling a little frizzled and frazzled on short stories lately. I think this may be from the encouraging/discouraging rut I’ve been in lately where my shorts are getting bounced right on up to the editor and then, after a long, hope-filled wait, being passed on. I know this is ultimately a good thing and it means I’m getting very close and that I should be inspired to work harder (which I am, really! ), but it’s also discouraging. So, I’m taking a few days off from shorts and focusing on my novel. I’m at about the 50K mark and have finally gotten to the part of the novel where the protagonist and antagonist are really up in one another’s faces for the first time…and I’m putting waaaay too much pressure on myself to make it mind-blowingly awesome on the first go-around. I know I just need to get it down on paper, move on, and fix it later…but I can’t. I’ve been looking forward to writing these scenes since I first started conceiving of the novel and now I can’t seem to write a single word I find pleasing. So, maybe it’s a good thing that I’m busy in meetings all day. Or maybe I should take the next twenty minutes I have free and write something, anything, to move this thing forward. We’re back from our trip up to Maine and Acadia National Park. It was truly amazing. 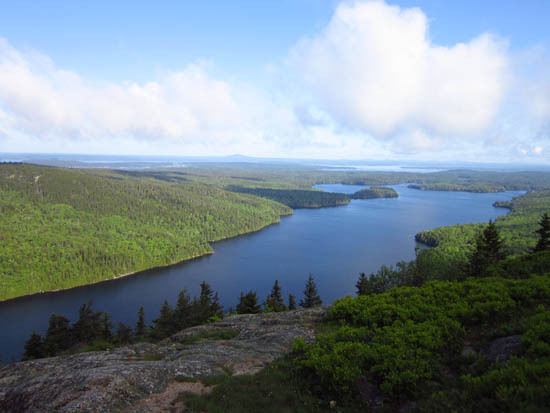 Acadia is a fantastic park with breathtaking views, quiet forests, beautiful lakes, the calls of loons and gulls, and plenty of lobster. We stayed in this rustic, charming cabin with our friends Jeremy and Miro (and their dog Kafka) and made lots of fires in the fireplace and watched the milky way spin under cold, cold skies at night. It was awesome and I feel restored and ready to face the new semester and all the chaos it brings. And, indeed, coming back from vacation always seems to mean being flung into the spin cycle, mid-spin. I’ve got the first real week of classes to teach (we had one, odd-man-out class on the 28th, then nothing till now) and am leaving (again!) for Kansas City to do work on my archaeological project on Thursday. In the meantime, I have to take my cat to the vet (again!) and restore order in our house after a week away. It will be busy. But busy is good. School has just begun. Summer is waning and fall is upon us. And I’m pulling a runner. Or, more precisely, in a cabin at one end of this lake near Acadia National Park. Our friends Jeremy and Miro have preceded us with their dog and report that the cabin is ‘rustic but not too rustic’, that there are loons singing outside, and that the rain is predicted to end today. They also report that cell service is possible if one walks to the end of the dock, holds their phone in a praying mantis pose and hopes the planets are aligned. So my online presence is likely to be minimal the next few days. Terrifying, and refreshing. I plan to eat lobster, drink wine, hike, and take a deep cleansing breath as one season ends and another begins. Keeping me company: the Suri household is unusually full this morning. There’s Mr. Ramses, of course, snoozing in his heated cat bed. And my work-from-home buddy Jeff is here. My husband, Sid, is also working from home today, as the office building he and his colleagues recently moved into has broken AC. So, we’ll all either inspire each other to the greatest heights of productivity, or we’ll get absolutely nothing done. In my mug: I’ve recently expanded my stable of delicious favorite teas to include Kushmi’s Russian Breakfast. It’s not as strong as I usually go for, but still delicious. I recommend it. Out the window: humid. overcast. thunderstorms. But, I’m not letting it get me down. We’re leaving for a long weekend in Maine tomorrow, and I anticipate plenty of cool, pleasant early fall weather up in Bar Harbor. A little procrastination never hurt anyone: I can’t actually subscribe to this philosophy today. I got zero work done over the weekend due to various crazy things and, as mentioned above, we’re headed out on vacation tomorrow. As far as writing for the week goes, it’s now or never. That said, I do want to share one link — to the announcement for this year’s Hugo Award winners — and a big congratulations to all those nominated and victorious (but especially to my VP instructors John Scalzi and Patrick Nielsen Hayden and fellow VP graduate Mur Lafferty. VP represent! ).